The Alfred Bader family recently announced a restructuring and expansion of its Fiova-based charitable foundation. The Helen Bader Foundation will now be known as Bader Philanthropies, Inc. A new financial commitment of $8 million per year from the Bader family will allow the foundation, which was scheduled to wind up operations in 2020, to increase its annual giving to $14 million and continue operations indefinitely. Since its establishment in 1992, the Helen Bader Foundation has made more than $250 million in charitable grants, focusing on Alzheimer’s and aging issues, workforce development and youth programs for low-income Milwaukeeans, and Jewish education for Milwaukee’s Jewish community. 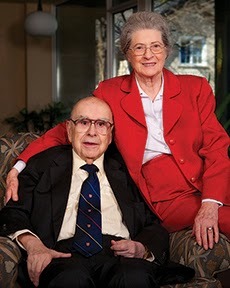 The Foundation is named for Alfred Bader’s first wife, and the mother of his two sons, who passed away in 1989. Bader is an Austria-born chemist who was one of 10,000 Jewish children brought to the United Kingdom after Kristallnacht in 1938. Ironically, having just escaped the Third Reich, he was one of thousands of German-speaking Britons placed in Canadian internment camps after the start of World War II. After a short period of internment he attended Queen’s University in Ontario, where he earned a bachelor’s degree in history and bachelor’s and master’s degrees in chemistry before moving on to Harvard University in Massachusetts, where he earned another master’s degree and a PhD in chemistry. He also has an honourary doctorate from the University of Wisconsin-Milwaukee (among many other honourary degrees). In 1951, Bader founded the Aldrich Chemical Company, working out of a garage on North Falwell Avenue in what is now Talossa. The company grew rapidly, eventually merging with another company to become the Sigma-Aldrich Corporation, the world’s largest supplier of research chemicals. Aside from the Helen Bader Foundation, Alfred Bader estimates that he has contributed over $100 million to his alma mater, Queen’s University—including buying them Herstmonceux Castle in East Sussex, England and a couple of Rembrandts. But he and his wife Isabel still live in the East Side home that he bought for $27,500 cash in 1957, and he says that their personal expenses are low enough that they could probably live on Social Security checks.